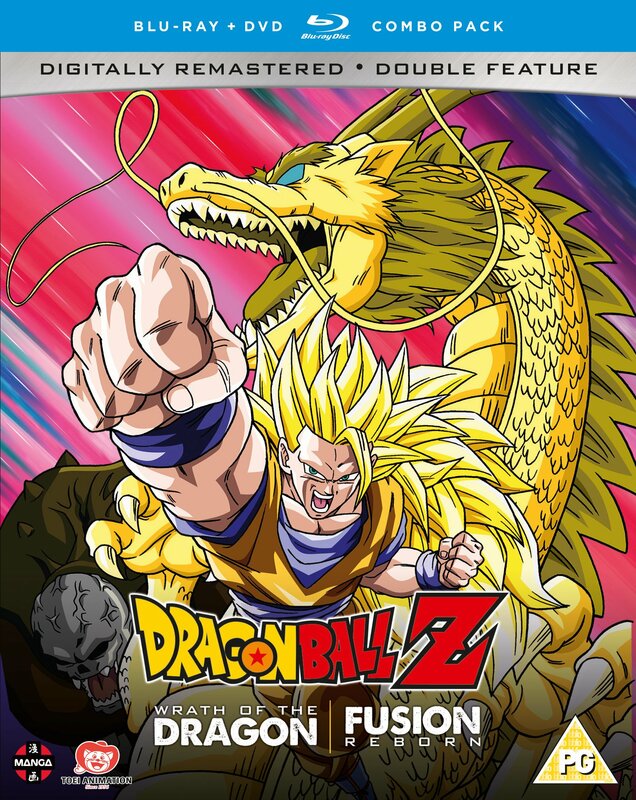 The 12th Dragon Ball Z Movie, “Fusion Reborn” (or in Japan “The Rebirth of Fusion!! Goku and Vegeta”, so… pretty much the same for a change!) was released in theatres in March 1995, the same time Gotenks was fighting Buu in the Time Chamber in the TV series, which, given this film is all about the fusion dance, shows that the creators were pulling ideas from the manga rather than the anime when it was being written. 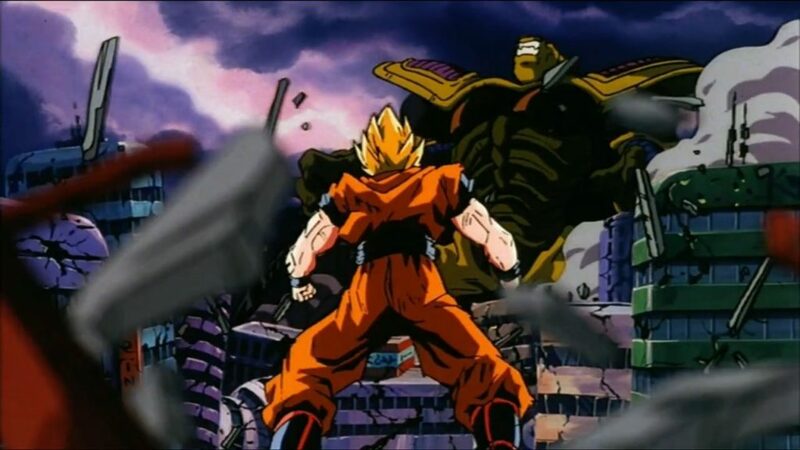 The film has Goku go Super Saiyan 3 and Goten and Trunks fusing to form Gotenks, so it was very timely, with these events only airing a short while ago on TV. It’s also set during the time Goku and Vegeta are both dead, with the latter being a spirit in Hell rather than having a physical body, which is interesting. I guess in this world either Gotenks or Gohan defeated Buu before either Goku or Vegeta could be returned to life, which is quite grim for our lead duo! 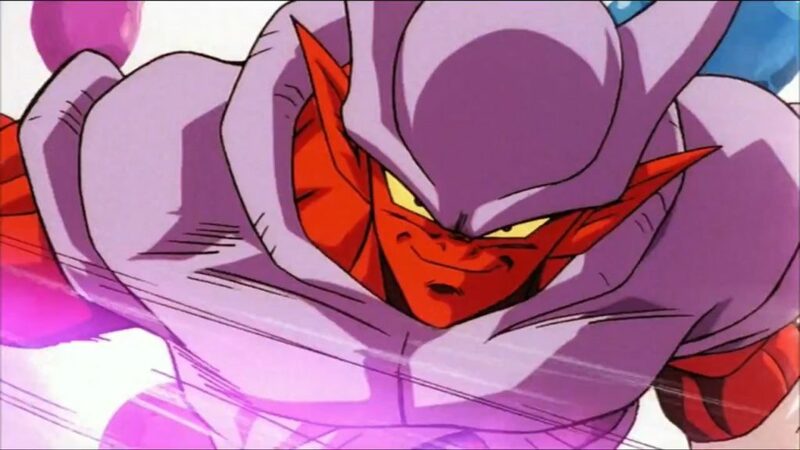 Anyway, while all this is happening, Goku takes on Janemba (the name of the large yellow demon) and manages to push it until it transforms into a smaller, humanoid shape which is much more powerful (so, again, allusions to Buu here…) eventually leading to Goku and Vegeta, who got his body back with the rest of the evil souls, doing the fusion dance to become Gogeta, something which isn’t a spoiler given he’s in the Japanese title and on all the posters and promotional artwork. Oddly, their first attempt fails and they turn into a fat Gogeta who bounces around farting, which … yeah, is odd, and only adds to the stronger sense of humour this film has, which is funny because some of the actual action and dramatic scenes are really good, with the thin demonic Janemba having some of the most unique looking and pretty “cool” techniques in the series. Overall “Fusion Reborn” is a fun film that doesn’t take itself too seriously, but at the same time has some of the better fight scenes out of all the films. It’s an odd mix! The main storyline here is that a long time ago, in a galaxy… no, sorry, a long time ago on the other side of the galaxy, some evil priests brought to life a giant, Godzilla-sized monster called Hildegarn (or Hirudegarn in the English dub, which I believe it how it would be spelt when the Japanese characters are translated into English, but the Japanese voice actors and indeed the subtitle track for the original dub use Hildegarn, same as the old VHS fansub I had, so… shrugs) and planned to rule the universe with its power, only for it to be sliced in half and each half sealed inside two local young flute-playing lads named Tapion and Minosha. The two were sealed in music boxes (because, why not?) and sent to opposite sides of the universe so the monster could never be summoned again. Flash-forward to present day Earth and a surviving evil priest has found and killed Minosha and now has control of the bottom half of Hildegarn and wishes to open the one containing Tapion, which is of course on Earth! Eventually Tapion is freed by our heroes (whoops!) and a good chunk of the film’s runtime is focused on Trunks forming a brotherly friendship with the warrior from the past, and Tapion’s struggle to keep the top half of the beast from emerging from his body. 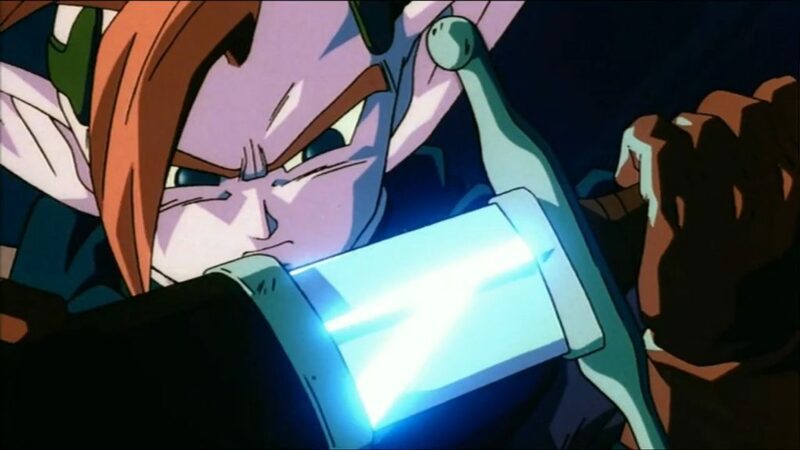 I’ll say it now: that timeline muddling I mentioned is that Tapion’s sword (and the sword that sliced Hildegarn in half) is the same sword Future Trunks had in the Cell arc, and indeed the end credits of the film show Future Trunks slicing up Frieza as if to drive home that “this was how Trunks got the sword”. The thing is, when Future Trunks was the same age he was living in the post-apocalyptic future where there was nobody around anywhere near strong enough to defeat Hildegarn or free Tapion, so this clearly wasn’t how Future Trunks got his sword, and instead just makes you wonder how Tapion’s ancient and sealed sword ended up in the possession of that version of Trunks in the first place! Anyway, you won’t be shocked to find out that eventually the large monster reforms and goes on a city-wide, Godzilla-like rampage, fighting off the lead cast and transforming into a more powerful form (of course!) before Goku defeats him, because if he couldn’t do it, then who would have? If you want another bit of continuity meddling, Goku uses a new move (perhaps the first and only move he actually created rather than learned from someone!) called the Dragon Fist, where he (somehow) turns into a large yellow dragon and impales his target. Goku uses this move a few times in Dragon Ball GT, meaning does this take place in the GT timeline? I guess there is nothing stopping it from fitting in, and Trunks does use the sword… in the intro to the show, so, why not? Movie 13 is a different kind of movie, giving us a new protagonist and seeing him develop a bond with the young Trunks, before we get a bit of a showdown to end the film. It’s all the better for it, too, and is certainly far removed from the lunacy that comes before it! I think this set has to have the biggest differences in tone out of any of them, but also has two of the higher quality films in general too. As per usual, just some trailers for extras on the set, so nothing new there. Should you buy Dragon Ball Z Movie Collection 6 then? Yeah, I think the two movies are two of the better examples of the 13 on offer, even if #12 is bizarre and #13 feels like it crosses over with a mid-90s JRPG (flute-playing, Elven-looking sword fighter anyone? ), they both make a change from “this is the new villain/villainous team, they’re strong, our heroes overcome them” which most of the films adhere to strictly. One film adds a weird and fun sense of humour and the other adds some gravitas and a touching bond to the mix. Out of all the six sets, this gives you the most variety to go along with your fun shonen action scenes. Having watched anime since it was airing late night on the Sci-Fi channel in the late 90s, I consider myself... someone who's watched a lot of anime, and then got hired to write reviews about them. Hooray! “Remember Frieza? He was good, wasn’t he? Why don’t we do that again.” And so Dragon Ball Z Movies 5 and 6 were created! Let’s have a look if they were any good, shall we? DBZ Movie Collection 4, awkwardly collecting Movies 7 and 9 (leaving 8 to be paired with the other two Broly movies… next month! ), is full of good action and loosely defined villains, as well as Androids and … very on-the-nose Space Pirates! Who doesn’t want to watch those?! 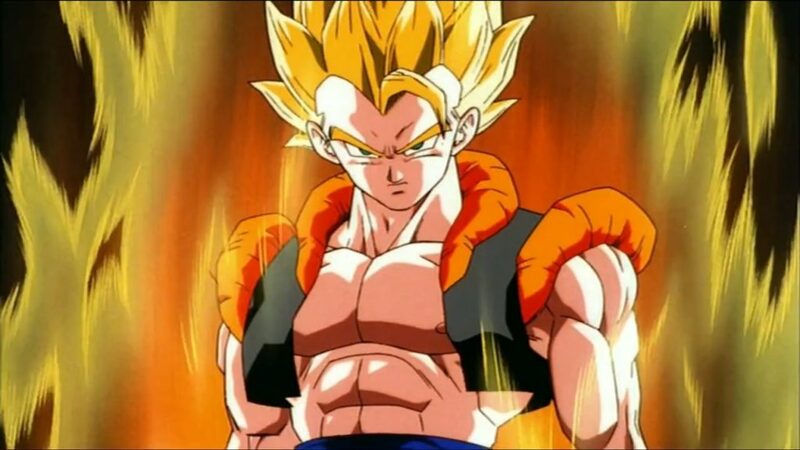 The Legendary Super Saiyan known as Broly is, undoubtedly, the most Marmite character in the Dragon Ball franchise. The phrase “you either love him or hate him” may as well be made for him, as seemingly most fans land on one side or the other, but does the truth lie somewhere in the middle? Let’s take a look at Manga Entertainment’s 5th movie collection, bringing together all three of Broly’s movies, and see, shall we? Just when you thought Manga was done releasing two Dragon Ball Z short-length films, they… well, they release two TV specials which are roughly the same length as the 13 films released previously. While there are differences between the films and TV Specials (and not all of them good), story-wise it’s hard to find two better examples of the Dragon Ball franchise taking itself uncharacteristically more seriously. Is that a good thing, though…?